On Thursday, I had my first “real” speed workout at a track on the north side of the city. I’ve heard of that track but never been there. I left work at 3:45 and made my way to meet my coach. I am usually good with directions but for some reason got lost and could not find the place. Luckily, I had left extra early and 10 minutes later of driving around finally found it. Let me say that I had never actually met my coach in person. I was not sure how I was going to find/recognize her. Luckily, she happened to be running around the track as I walked up and we just stared at each other. Yes, it was her!! I was nervous about my workouts. She told me not to be. We were doing 1 mile warmup, 4×400, and 1 mile cooldown. The first mile was under 10 minutes. Not bad, not bad. The rest was even better! I was impressed with myself. Coach told me I had good running form and was not a heavy breather. Whew. I was worried about that because I usually am a heavy breather. The goal was to run each interval under 9 minutes. Mission accomplished. I enjoyed running at the track but there isn’t one close to where I live. Oh well, I guess I can make the 40 minutes or so drive once a week or every two weeks. Or I can just run them on the treadmill. You ready for a giveaway? For the past few weeks I’ve been running in Injinji toe socks. Love them! It is a little weird to put them on but once you get the hang of it, it is a piece of cake. I even wear them on nonrunning days. I have two pairs of socks for two lucky readers. One pair is white, size small, crew length and the second pair is black, size large, and mini-crew length. Please make sure to write in the comments section the size you want (S or L) if selected as a winner. I’d like the small socks:) I’ve never tried this kind before. My favorite brand of running socks is Feetures. The small pair! My rainbow ones have finally developed a hole after almost 2 years and these are all I run in during the summer months. I’ve never tried Injinjis, but I keep hearing good things, so I’ll put my name in for the black ones. 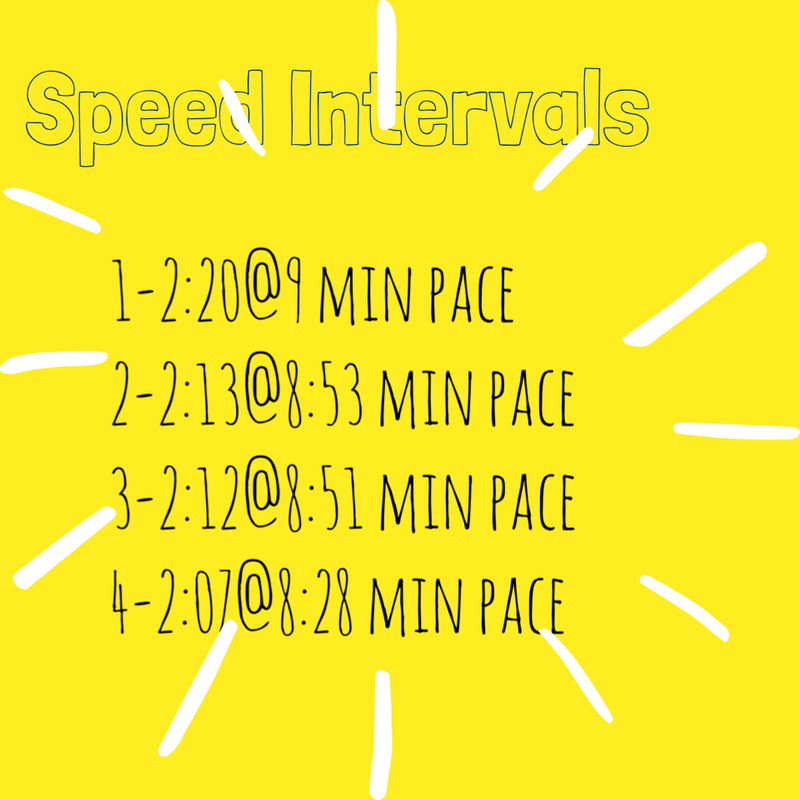 Great job on your intervals! I have friends who swear by these socks but I have never tried them! I entered for the black ones. Currently, I’m a huge fan of ProCompression socks while I run. Good job on your speed workout. I did mine this morning and it’s tough. If I win I would like the small. I would like the large, please! I like smartwool and feeture socks! I usually use swiftwick but have been told I need to try the injinjis…so…yeah. Hah!